We all experience moments in our life when the silliest things give us the willies. We got the wobbles, our knees knock, and what we’re afraid of masks what we’re capable of. Luckily, we can call upon our practice to help us ignite our inner fire, uncork our inner wisdom, and awaken our warrior spirit—leaving us calmer, clearer, more confident, courageous, and empowered, so you can be fearless and ready for anything. Here are my top five powering up yoga poses. Headstand cultivates poise, focus and strength, and will therefore awaken these qualities in you. Although it is taught in many beginners’ classes, it is a complex pose that should not be rushed and should be practiced with patience. 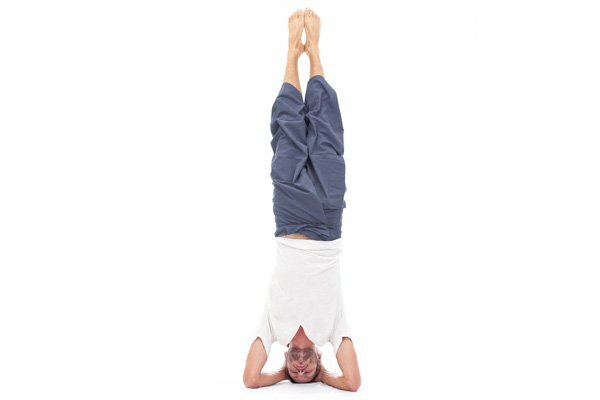 Headstand, as an inversion, stimulates and flushes refreshed blood to the pituitary and hypothalamus glands, which are closely connected to our wellbeing and healthy hormone function since they govern other glands in the body too. Plus, it’s fun and kinda difficult to be stressed or depressed when you’re upside down! Eagle Pose cultivates grace, surrender, and grounding. It is a balance that asks us to establish our foundations with the earth through the grounded foot, grow strong in the legs, find strength in the core, and then seek length and lightness through the upper body. As we elegantly spread our eagle wings, wrap them around one another, and proudly present them to the sky, the back of the heart space is stimulated and squeezed. As the arms are released, a fresh supply of deoxygenated blood helps remove stagnation. Child’s Pose cultivates surrender and faith. When we relax here with our head bowed towards the earth and our belly compressed, it gives us enormous relief when we’re feeling overwhelmed, stressed, or afraid. No longer are we outwardly facing the world; instead, we’re sheltering in a cocoon of our own creation. The sensation of the earth beneath us is reassuring and we feel supported. The gentle pressure on the third eye and abdomen is calming and will help you connect with your inner wisdom. From this safe space, we’re able to re-establish ourselves, surrender to what is, and re-secure our faith in what will be. (Another option: Crescent Lunge Twist or Parivrtta Anjaneyasana) Both revolved poses cultivate presence, an open mind and an open heart. Parivrtta Parsvokanasana is one of the more challenging standing postures since it requires strength and stability in the legs, flexibility through the hips, spine, and lateral planes of the body, together with balance and peace of mind as the heart spirals open towards the sky. Performing this posture can take time, so take a Crescent Lunge Twist with the back knee to the floor as a modification if this is more available to you. Like all deep twists, both poses detox and tone the organs within the abdomen and stimulates your manipura chakra, the centre of personal power, igniting your inner fire, increasing your confidence, and leaving you radiating a renewed sense of self. Camel Pose cultivates a ready-for-anything attitude. 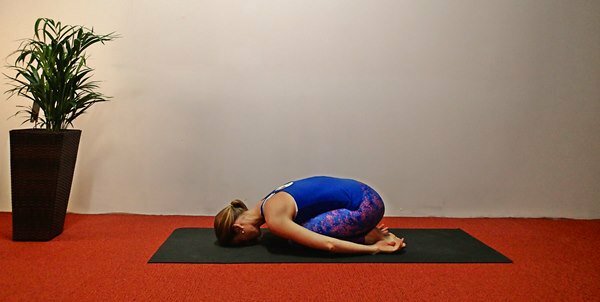 This pose opens the entire length of the front body including the ankles, groin, belly, chest, heart, shoulders, upper back, and throat (if it’s comfortable to bring the head back)—stimulating the inner organs, shifting energy, and bringing with it a sense of spaciousness in the mind, too. Like all backbends, Camel is energising and uplifting because it simulates and cleanses the central nervous system through the squeezing and activation of the spine. Backbends help us arrive at the right attitude, to meet whatever life throws at us head on. So the next time you feel your inner warrior going into snooze mode, include a healthy dose of prescription poses such as the ones above into your practice, so you can power up and awaken that warrior within!